I pulled these shoes out of retirement this week. Two years ago all I wanted was a fabulous pair of heels to wear with each and every outfit and I have more then I can count. Crazy how priorities and convenience can change in the blink of an eye. I am glad that I remembered how to walk in these puppies because Jonathan would have really made fun of me if I stumbled (he thinks I have gotten a little lax in my dressing up abilities, which is TOTALLY true). I am so thankful that the relaxed look is still in style because I take full advantage of it everyday now. I will say, it was really fun getting to walk around town in my Louboutins and to wear jewelry for one night. These beauties are safely back in their box until the next time I want to be 5 inches taller. Now bring back my flats, please! To keep on my budget friendly findings, I was able to grab this crop top for under $15. I also want to share some similar styles that I also have my eye one. This draped crop top is now on sale under $50 and this one is under $10. These shoes are definitely fabulous! I love that you paired them with the ripped jeans. I love that cropped top! It has a beautiful structure to it – plus the statement necklace makes a beautiful pairing! You looks stunning in this black top and jeans. And I love your classic heels. They are perfect. Those heels are amazing (and high). You look like you rocked them! Love this look!! Those heels are gorgeous! 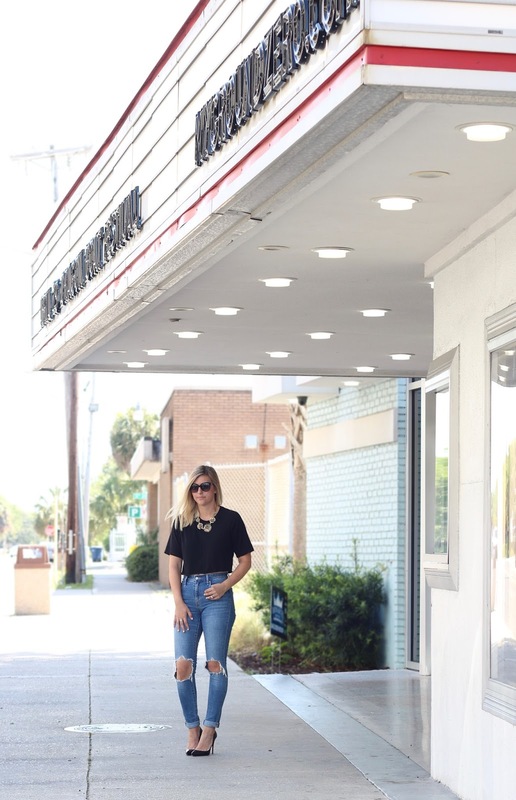 This outfit is the perfect blend of casual and chic! Those jeans are so perfect, and the heels will go with everything! Love the look. Simple but stylish.